We begin to see a pattern with Thom Tillis, how he's going to manage to still run the NC House while also running for the U.S. Senate. Fellow House member Robert Brawley (R-Iredell) challenged Tillis on the issue of whether a North Carolina city should have the right to set up its own municipal broadband service, and for his uppityness, Brawley was primaried and will now lose his seat in the House. But that was apparently not sufficient punishment. The NC House Republican Caucus has kicked Brawley out of the Caucus, turning him into a ghost who wanders the ramparts, sighing "Remember me!" None of this would have happened without Tillis's blessing, but does Thom Tillis publicly own his revenge. No, he hides. He wasn't even present at the Caucus meeting that expelled Rep. Brawley. What? A stand-up guy, he is not. Meanwhile, Phil Berger's NC Senate (with bobble head Dan Soucek bobbing right along) rushed through a fracking bill and sent it off to the House, where there's a good deal of hemming and hawing and clear uncertainty that Mr. Tillis wants to open that particular can o' worms, not with tensions already high over Duke Energy and coal ash pollution and the appearance that the GOP wants to poison the whole earth to make their corporate pals happy. 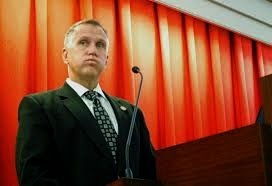 Stagnation ahead is our prediction, as Tillis avoids any appearance of extremism that might hamper his Senate bid. But dodging and weaving does not a winner make. thom how dare u use our troops for your own agenda when u use our freedom of speech to tell bold face lies i think u do not know what our troops have fout and died for umay disagree with kay hagen is fine do it without diegracing our freedoms u need you mouth washed out with SOAP like many to learn lis are wrong no matter who tells them! !